This place has been around since the mid 70's but only recently have I visited. My wife has been going there for years and figured it was about time she got me in the door. 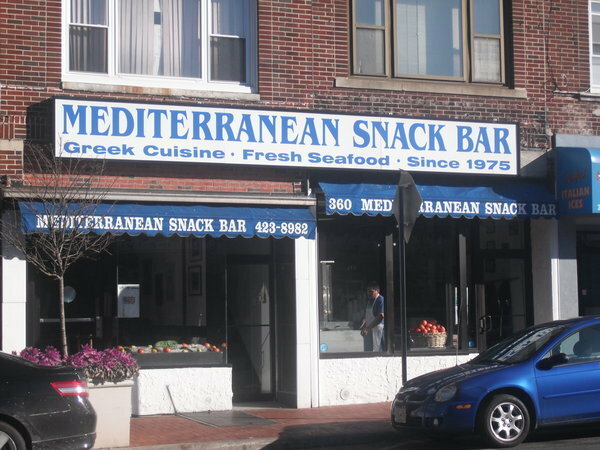 Be forewarned that this authentic Greek place is located in Huntington village and therefore parking can always be an issue. There is a small parking lot within 2 minutes walking distance on Elm St (the closest cross street). Although the entrance is minimal, with a small open kitchen directly to your left, you are immediately greeted by smiling faces and traditional Greek blue and white everywhere. Take a look at the photos on the walls, many of which were taken by the owner, Steve, over the years during his trips to Greece. The service was not bad but also not over the top, the staff sort of lets you be to enjoy your food which is fine unless you need something but we were fine with that. I ordered the lamb shank and my wife ordered the chicken souvlaki dinner, both of which came with pita and greek salad. The salad is amongst the best I've had--it is chopped and includes fresh dill and celery--something you don't see in many greek salads. The dressing is really what makes it. The pita comes plain, but if you ask for it to be fried, it's even better. The tzatziki is a little on the loose side but tastes great. We made sure to get extra. Lamb is not something I order often because it can really be a hit or miss. This place knows what they are doing! It is succulent and cooked perfectly. The chicken souvlaki has great seasoning as well and pairs perfectly with the tzatziki and rice pilaf that comes along side it. For the money, this place is even better. Although some of the appetizers seem a bit overpriced, the entrees are pretty much right where they should be and I can almost guarantee, you will not leave here hungry! It caters to a large lunch crowd as well as dinner, so I'd recommend coming here for a late lunch or early dinner if you don't feel like waiting--but if you do have to wait, I'd say it's worth it! Remember to bring cash! They just recently started accepting cards but you cannot leave a tip on it.